How can you drink premium, award-winning, small-lot wines from Napa Valley AND support a cause you care about? You’re in luck… there’s a club for that. Four, actually. Experience one of Le Chanceux’s incredible Wine & Vine Clubs. Enjoy award-winning Napa Valley Cabernet Sauvignon from the esteemed Belles Filles Vineyard, exclusive member offers & benefits, and a vine with your name on it. You’ll be sipping the best of the best and supporting the very vineyard it came from. 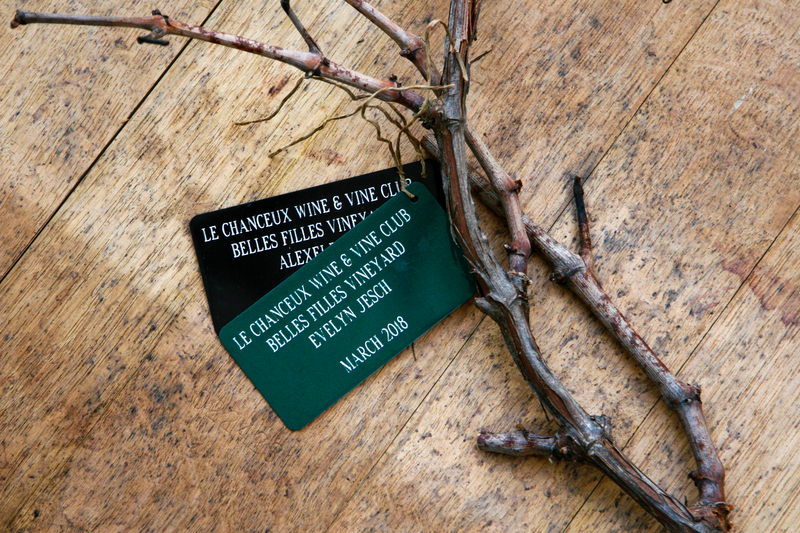 Summon your good luck by adopting a vine in Belles Filles Vineyard! Onetime fee of $60 plus a 3 bottle purchase of our award winning Cabernet Sauvignon. $20 flat rate shipping per shipment. Wine ships in Apr. & Oct.
● Receive a certificate of an adopted vine and a vine tag with your name & month adopted tagged on a vine. You will continue to maintain your adopted vine as long as you purchase any 3 bottles of wine annually. Your vine tag is yours to keep if/when you opt out. ● Picnic in our beautiful conservatory when you are in town! Experience Le Chanceux and Belles Filles Vineyard. Receive 6 bottles twice a year (12 bottles total) of our award-winning Cabernet Sauvignon. $30 flat rate shipping per shipment. Wine ships in Apr. & Oct.
● Receive a certificate of an adopted vine and a vine tag with your name & month adopted tagged on a vine. Take your experience of Le Chanceux and Belles Filles Vineyard to the next level. Receive 8 bottles twice a year (16 bottles total) of our award-winning Cabernet Sauvignon. $40 flat rate shipping per shipment. Wine ships in Apr. & Oct.
Good luck for a lifetime! The complete V.I.P. experience of Le Chanceux and Belles Filles Vineyard. Receive 12 bottles twice a year (24 bottles total) of our award-winning Cabernet Sauvignon with free shipping. Wine ships in Apr. & Oct.
*All clubs include two shipments per 12 month period of our most current release (subject to availability). Your wine shipments will begin shipping the month closest to April or October and will renew annually after both shipments are sent. We hold shipments for inclement weather & ship when weather permits. Club members will receive complimentary tastings for 2 when visiting Belles Filles Vineyard. Example of exclusive offers may include: wine discounts, harvest invites, vineyard practices class discounts, dinner discounts, etc. Points earned are converted to a dollar discount and are not transferable or redeemable for cash. Points must be used toward one of Le Chanceux’s Taste & Dine packages or forfeited within 2 years from the membership date (first club shipment) they were awarded. Club membership, including benefits, are subject to change at proprietor’s sole discretion and you will be notified of any changes. All benefits will end if membership is cancelled (you must contact Le Chanceux to cancel). We ask that you commit to a minimum of 2 shipments and any shipments already billed/shipped are non-refundable. If you would like your adopt a vine tag after cancellation it will be mailed to you for a $5.95 s&h charge. Unfortunately we are unable to ship to AK, HI, MS, ND, NH, PA, KY, UT & VT.
**Details to be agreed upon by club member & vintner. Min.12 guests. Additional fees may apply.